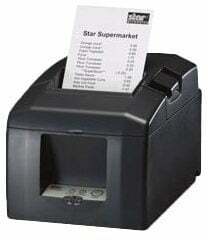 Star TSP650 Series: TSP654 - Thermal printing, Auto-cutter, Serial interface. Power supply (Part# 30781753) and cables sold separately. Color: Dark gray. The Star TSP654 boasts valuable features like an auto-cutter, low cost and high performance combined with the ability to work effectively in any environment. Out of the box, the TSP654 can easily be configured in Star Line or ESC/POS emulation mode and features a wide variety of interface options including USB and Ethernet due to its plug-in modules. New vertical mount stand and splash proof cover options help make it one of the most reliable POS printers in the world. The Star 39448510 is also known as Star Micronics	39448510	.